Signals the start of a practice or qualifying session or the start or restart of a race. Also signals a clear course. Slow down, no passing, hold position. Slow down, no passing, immediate danger, unsafe driving conditions on the track. The signaled car must go immediately to the Black Flag Station in the pits for consultation. Signals that you are to enter the pits. *Note - finish going around the track and then pit. Signals a complete stoppage of driving activity. Come to a controlled stop as quickly as possible at edge of track and within easy access of a marshal/flag station. Upon indication from a corner worker, proceed cautiously to pits. Check your mirrors and give consideration to the overtaking car, be prepared to expedite a pass. Between corners 6 and 8 cars may be going 60 MPH faster than you, move to the left even if you don't see a car in your mirror. It's coming! Signals completion of the session or the race. Enter the pit at next opportunity. Signals that an emergency (or slow moving) vehicle is on the track. Signals you to exercise caution due to a slippery condition or debris on the track. Note: The White and Red/Yellow Stripe flags shown above are in common use for race events but are seldom used in non-competition events. Signalling a Pass or Intention to Pit. 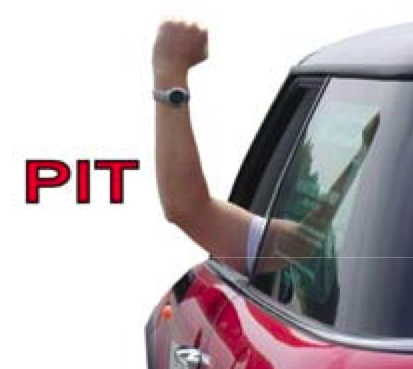 Arm out and up, in a fist is the signal that you are pitting. Arm out and pointing to the right is the signal for passing on the right. At Mosport all passing will be done on the right. An alternate and very appropriate signal is your turn signal. The right signal indicates pass on the right. Be cautious if a novice driver's signal goes on - it might be an accident. 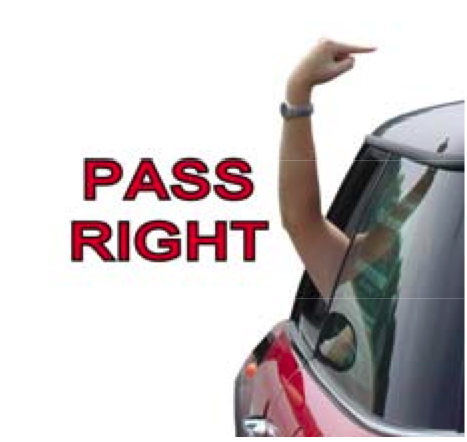 If the lead car signals a pass outside of a passing zone OR in a passing zone where the pass cannot be completed safely, DO NOT take the pass. DO NOT pass in a corner. DO NOT pass unless you've been given an obvious signal. DO NOT pass more than one car without getting an obvious signal from each. An alternate and very appropriate signal is your turn signal. 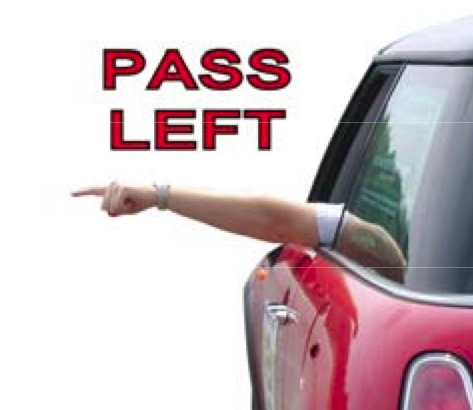 The left signal indicates pass on the left. Be cautious if a novice driver's signal goes on - it might be an accident.